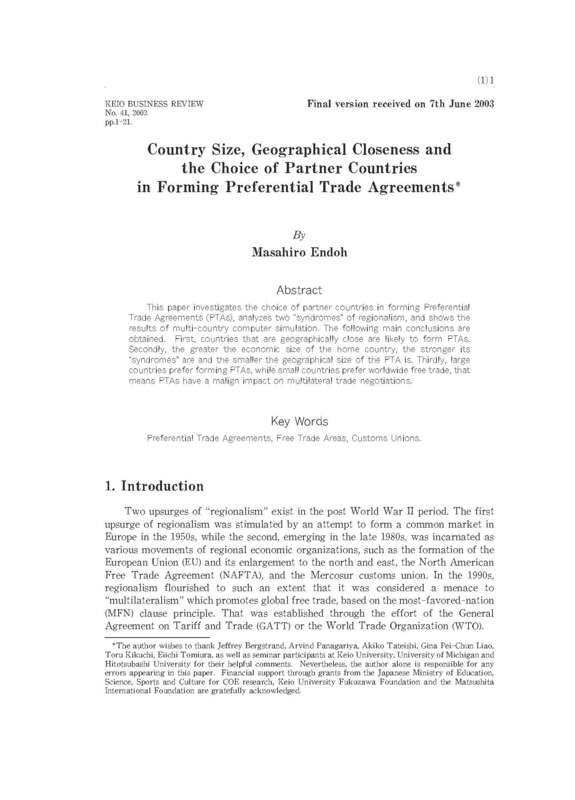 This paper investigates the choice of partner countries in forming PreferentialTrade Agreements (PTAs), analyzes two “syndromes”of regionalism, and shows theresults of multi-country computer simulation. The following main conclusions areobtained. First, countries that are geographically close are likely to form PTAs.Secondly, the greater the economic size of the home country, the stronger its“syndromes”are and the smaller the geographical size of the PTA is. Thirdly, largecountries prefer forming PTAs,while small countries prefer worldwide free trade,thatmeans PTAs have a malign impact on multilateral trade negotiations.